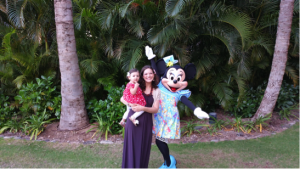 The paradise of Hawaii mixed with the magic of Disney- what more could anyone ask for? Disney’s Aulani Resort & Spa in Ko Olina does not disappoint in any regard when it comes to having a vacation with memories that will last a lifetime. As a veteran of both Disney World and Hawaii, I had some familiarity with both destinations. However, this would be the first time I ever would experience a Disney resort outside of Disney World. 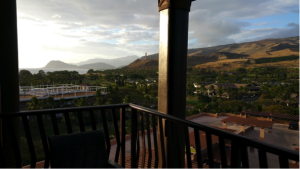 I had been to Hawaii several times before and stayed at some of the most beautiful resorts on the Big Island, Maui, and Kauai, but this was my first time to visit Oahu. I discovered that every island in Hawaii has something different to offer and each has its own unique characteristics. Oahu is the third largest island in Hawaii. 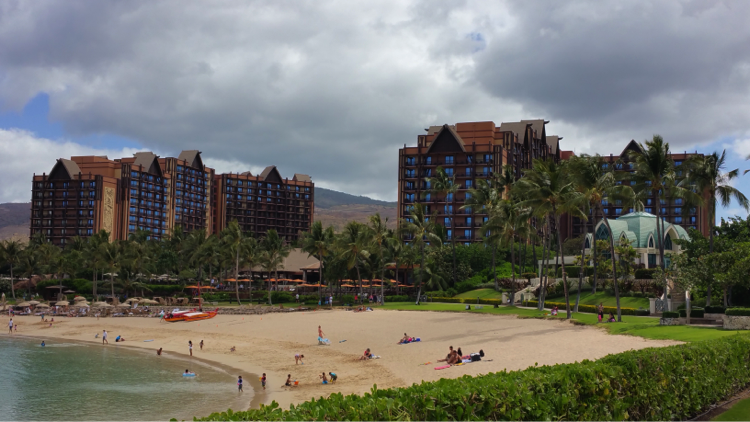 It is known as “The Gathering Place”, and has several highlights, including: the capital Honolulu, Waikiki (the iconic beach), and Pearl Harbor. 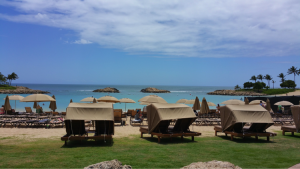 Oahu is known for its city and nightlife, as well as for its diverse population and rich traditional Hawaiian culture. 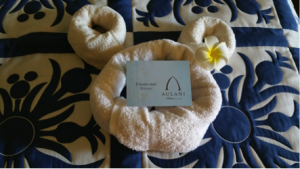 Disney’s Aulani resort is located approximately 20 miles from Honolulu International Airport. Depending on traffic, which can be pretty heavy at times, the entire trip can take up to 35-40 minutes. 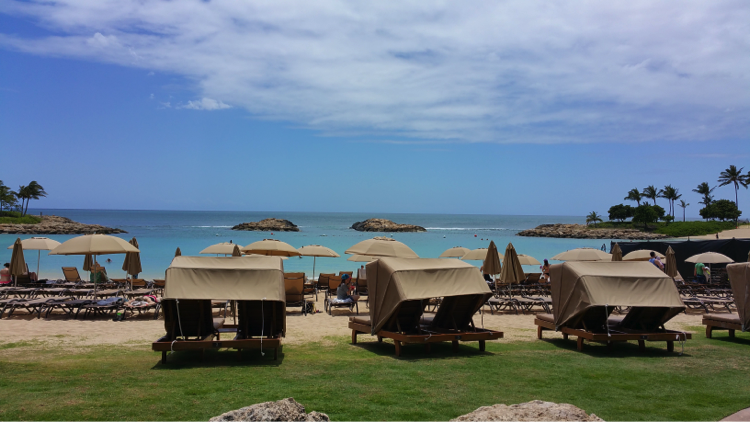 Aulani is located off of the coast of Oahu on the beautiful beaches of Ko Olina. 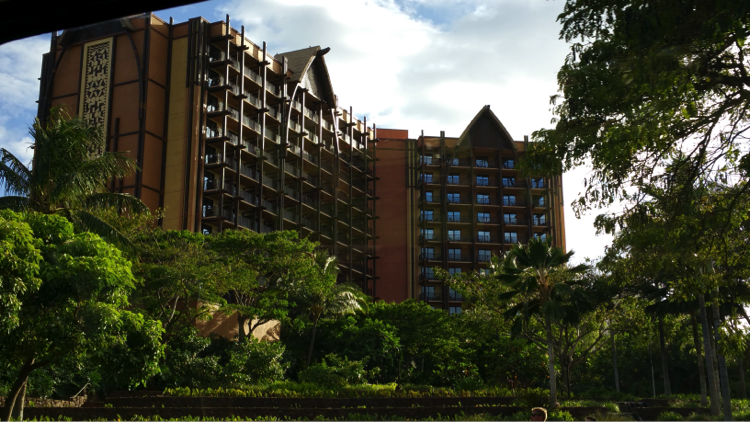 As you approach Aulani, the first thing you notice is how grand and magnificent the resort looks. The landscaping and gardens as you approach the entrance are extremely clean and well-kept. Then, from the moment you step onto the property, you can immediately feel the amazing Disney touch; it can only be described as “magical”. From the cast members’ friendly greetings with flower leis and iced lemon water to the open-air lobby overlooking a picturesque view of the bay, every moment is breathtaking. You look around and truly get the feeling that you are “finally on vacation”. The thing that sets Disney apart from other resorts is the attention to detail. 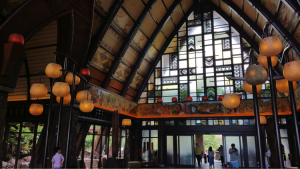 Aulani has an incredible influence of Hawaiian culture, tradition, and history that can be seen everywhere as you walk around the resort. From the murals and artwork in the lobby and hallways to the gorgeous palm trees and landscaping, every area is given special attention. 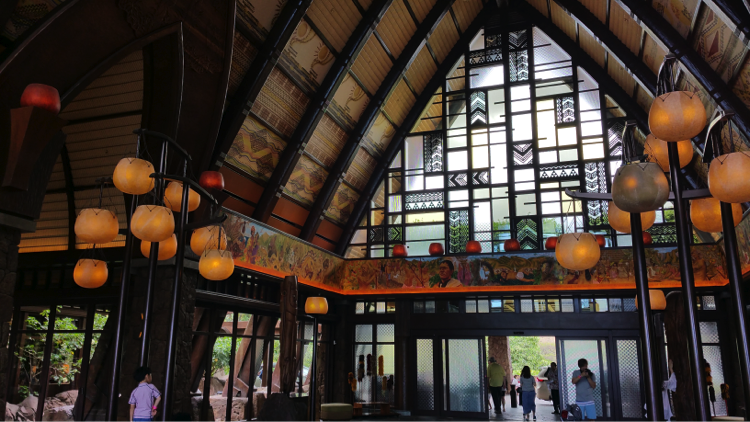 Even as you walk through the resort you will hear Hawaiian music being “piped” in just as it is in Disney World. Our experience with the check-in process was very quick and efficient. All the cast members went out of their way to make sure everyone greeted us with an “aloha”, making us feel very welcome. 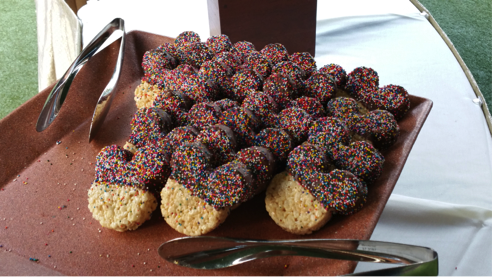 We were greeted with a welcome reception as well, complete with appetizers and Mickey-shaped desserts. After our welcome reception, we settled into our room. 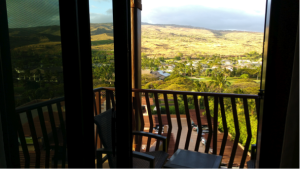 We had a standard room (2 queen beds and bath) and a balcony with a view that could only be described as heavenly. We immediately noticed the “Disney touch”. On our beds, we found towels in the shape of Mickey ears. Around the room, there were additional subtle Disney touches, like a Mickey lamp and “hidden Mickeys” found in the comforter and in the wall paintings. (My wife and I have a tradition of finding Hidden Mickeys at every Disney resort and throughout Walt Disney World. We continued this tradition throughout the resort, which added to the fun. It felt like I had been transported to Disney World, even though I was in Hawaii.) The room had a lot of amenities that you would not typically find in a regular hotel room, such as refrigerators, a “Pack and Play” in the closet (essential for those traveling with young children), and a fully stocked cabinet that had a coffee maker and a hot water pot for tea. Now onto the daily activities and entertainment! Every day, the resort publishes a daily news bulletin that highlights the day’s activities. The activities change every day, and include things such as: sunrise yoga on the beach, arts and crafts for kids, games, lei making, etc. At night there are some added special events. These events include: stargazing, fire pit storytelling, a teen sunset party, or even just sitting and relaxing listening to Hawaiian music at the outdoor Oleo room lounge. Our favorite nighttime activity, though, was the outdoor movies. These movies allow you the opportunity to grab a mat and lay down with some popcorn to watch come classic Disney movies. My family and I went to the outdoor movie on our first night at the resort, which was very relaxing after a long trip. I was amazed at the video quality and surround sound audio. For an outdoor movie, you really felt as if you were inside a theater. But, I guess you could expect no less from Disney! The pool area is one large, magical, water wonderland. The area is massive. It includes a long lazy river, two exhilarating water slides, and a large children’s only play area complete with fountains, bridges, and slides. The numerous large pools around the resort each have unique characteristics. There is something for everyone! A zero entry pool makes it easy for young children and infants to enter because they can walk right in. There is an infinity edge pool with a hidden hot tub, and an adult-only pool, giving guests of all ages the ability to enjoy in the fun and relaxation. There is even a man-made saltwater lagoon with tropical fish and coral for guests to snorkel in, while spectators can look on from a separate viewing area. And if you love seeing and meeting the characters like Mickey and Minnie, they are out and about several times during the day. 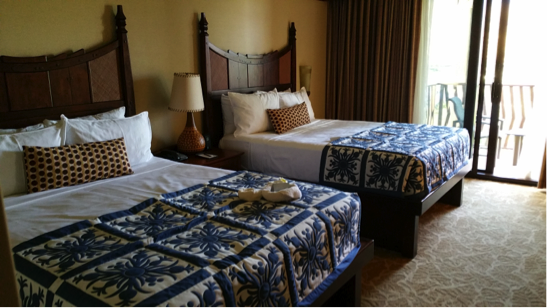 You will never have to worry about having the opportunity to see them during your Aulani stay. Not only are they available for meet and greets around the resort, but they also have a pool party with the children almost every day. They will walk around the pool area giving high fives and saying hello to everyone. (There was even a time when I splashed down the slide and Goofy was standing there at the bottom waving to me.) The pool parties that the cast members put on are a blast for not only the children, but for the whole family. The entire scene is entertaining with games, music, and dancing with the characters. They even get in the zero entry pool with the young children and their parents during the party. The beach/lagoon is only steps from the pool area, and looks like something out of a postcard. The beach area is the cleanest beach I have ever seen, not to mention relaxing. The water is very calm, so it’s not an ideal area for surfing or body boarding, but there are a number of other beach activities available to enjoy, such as kayaks and snorkeling. I don’t have many negatives about this resort. The only thing I would say is that it is fairly crowded. You notice the crowds the minute you enter. The pool area was very crowded and the lines for the slides were quite long. The lazy river was packed, and it was difficult to find inner tubes available at times. Our stay was at the end of April, which isn’t a busy time, but it still felt busy. One of the cast members even stated that they were only at 70 percent capacity, so I couldn’t imagine what it would be like during the summer months! 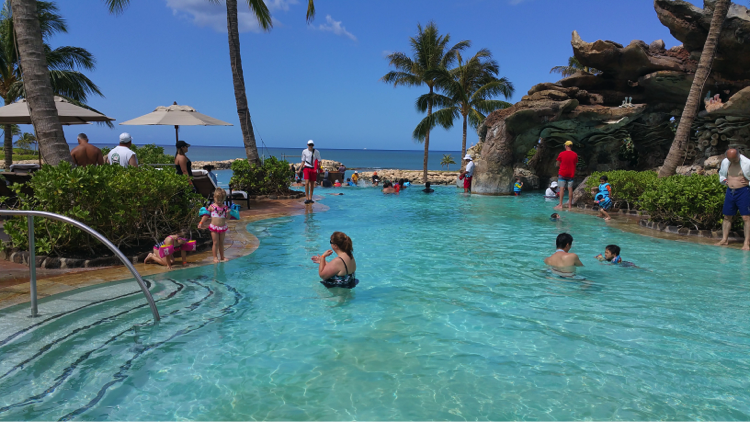 Also, because of the crowds, the hundreds upon hundreds of children, and the endless strollers seen around the resort, I would not recommend this resort for honeymooners. The price for food can be pretty expensive as well. Be prepared to spend over $40 per person for the breakfast and dinner buffets. Lunch around the pool areas can range from $15-$25 for hamburgers, hotdogs, and wraps. You will notice how quickly your room charge adds up by the end of your stay. I highly recommend purchasing the refillable souvenir mug, which gives you unlimited non-alcoholic drinks for $18.99. Aside from their price, though, the restaurants on the property are top notch and will not disappoint. The resort boasts ten “table service” restaurants, “quick service” restaurants, lounges, and cafes that offer delicious and unique items with a Disney flare. Disney character breakfasts are offered every morning and it is fairly easy to book reservations. 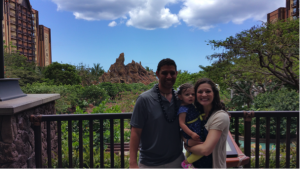 The best thing about Aulani is that as a parent, you can totally relax. 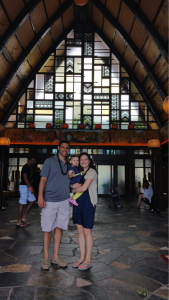 All throughout our time at Aulani, my wife commented how she felt she could relax and enjoy her vacation more knowing that our 1-year-old daughter had activities that would be fun and enjoyable for her. Disney even went so far as to provide a Community Room for us, complete with lockers, shower facilities, big screen TVs, and couches for us to use while we waited for our flight after checking out. Overall, this family-friendly Disney resort is truly exactly what it is set out to be: fun and accommodating for the whole family. 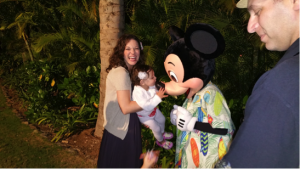 Disney caters to families with children of all ages, including the adults that want to relive their childhood. (Believe me when you zip down the waterslide in a raft, you will feel like your 12-year-old self again!) When Walt Disney opened Disneyland in 1955, he envisioned a place where both the parents and children could laugh and play together. 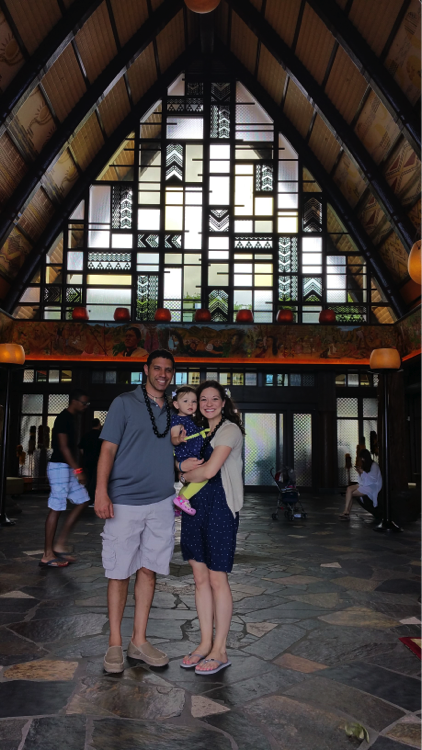 Disney’s Aulani does exactly that, combining the quintessential Hawaiian experience with the fun family enjoyment of Disney. Disney Aulani – Hawaiian perfection! Been going to Disney World ever since I was 4yr old with my family and have been going almost every year since. Been there almost 30 times making new memories every year. 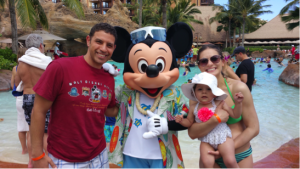 When I'm not at Disney I am a dentist with my wife and 16m old daughter who already had her first trip when she was 8months old.